BrightHaven > Blog > Events > Fundraising > What Do You Know About Classical Veterinary Homeopathy? What Do You Know About Classical Veterinary Homeopathy? Classical veterinary homeopathy is a key ingredient of BrightHaven’s Menu for Healing, which is the cornerstone of BrightHaven’s unique approach to living well through the last breath! Before talking more about this fascinating subject, it’s important to understand that homeopathy is a holistic modality. Oftentimes people get confused between the two words, thinking they mean exactly the same thing. Holistic medicine treats the entire being: body, mind, emotions and spirit. “Dis–ease” denotes an “out of ease” or unbalanced state. Often, holistic approaches can detect problems at the dis-ease state and correct the imbalance before serious illness sets in. “Holistic” encompasses all things natural. It spreads, like a large umbrella under which modalities like homeopathy, Reiki, acupuncture, herbs and flower essences, to name a few, sit. Basically homeopathy is a form of holistic medicine used by over 200 million people worldwide to treat both acute and chronic conditions. It is based on the principle of “like cures like.” In other words, a substance taken in small amounts will cure the same symptoms it causes if that same substance was taken in large amounts. Homeopathic medicines are manufactured using a process combining serial dilution and succussion, which is vigorous shaking. Homeopathy is a complete system of medicine that involves treating the individual, an animal or a human, with highly diluted substances, given either in tablet or liquid form, with the aim of triggering the body’s natural system of healing. Based on his or her very specific symptoms, as well as health history, a homeopath will match the most appropriate medicine to each patient. BrightHaven has seen astonishing results in our animals over the years and when one looks at our track record of animals’ health and longevity, one may wish to remain open to this method of care. Meet Sophie! She is now in her 20s and still plays like a kitten. 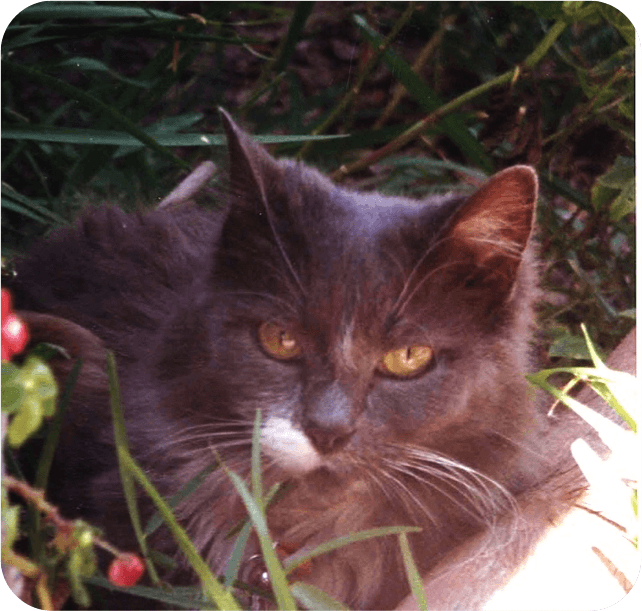 Sophie has been treated with classical veterinary homeopathy since she was two years old and suffering awful stomatitis. After the removal of all her teeth and great homeopathic prescribing by her veterinarian Dr. Pat Bradley, the disease went into remission and has never returned. Learn more about Pat and other members of BrightHaven’s Team of Contributing Homeopathic Veterinarians, all volunteers. Each BrightHaven animal is fortunate to have a volunteer classical veterinary homeopath. All classical veterinary homeopaths are also DVMs. We continue to offer homeopathic care through all life stages, even through the very end of life, as we view healing as essential for transition as well as continued life. Homeopathic remedies stimulate the body to heal itself and we firmly subscribe to the belief that, while the body is able to express its out of balance state by producing symptoms, it is still able to heal. Sometimes this process will be followed until continued life occurs—or death approaches. So if symptoms are present, we are still treating, and if symptoms are not present, and death is imminent, then there will be no need to treat. Hence, no symptoms indicate no pain or suffering. BrightHaven also uses conventional drugs in our healthcare regimen if needed. We simply do not use them terribly often in chronic disease unless the animal is unable to respond to other methods or maybe needs faster help. We can first treat with remedies but if they are unable to help quickly enough our vet can prescribe the appropriate drug, or advise us to take the animal directly to an emergency clinic for treatment. Want to Learn More About How Homeopathy Came to BrightHaven? 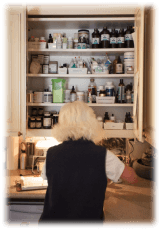 Gail shares how BrightHaven discovered classical veterinary homeopathy. You should consult with your vet before making any changes to your animal’s healthcare regimen. How Can I Help BrightHaven Help More Animals? Our goal is to create accessible and informative resources to share the BrightHaven approach with the community, so that more animals are able to live well through the last breath! Subscribe to our email list and join the BrightHaven family! Help us to get the word out! Share this post with friends and family on social media! The BrightHaven Animals Know All About Love! More Of What Makes BrightHaven So Unique!